Taana Baana is known as a one of the famous Pakistani fashion industries. Many senior and talented fashion designers of presents exclusive seasonal collections in every season. 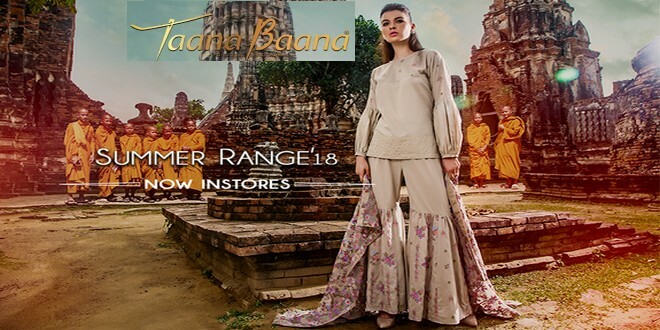 At this time, one of their famous fashion designer Phulkari has presented its latest variety of embroidered summer dresses in Phulkari Lawn Collection 2018 By Taana Baana. Moreover, the front side of each dress in Phulkari Lawn Collection 2018 Vol-1 By Taana Baana has enriched with embroideries. You will find embroidered neckline and hemline in different dresses of this latest lawn dresses collection 2018. You will find different styles of shirts with embroideries in this collection. It’s up to you that which type of dress you want to wear to make yourself classy in the gatherings of this summer season 2018. The word Phulkari itself means ‘ growing flowers’ and standing true to its name, Phulkari includes high quality floral designs in bright colors. With a rich history dating back to the 15th century, Phulkari is a traditional pattern of weaving, which is popular amongst the women of Punjab. It also is the most admired form of handwork around the world. Though the origins of Phulkari cannot be traced, several references have linked it with Punjab.